Spending her days served and waited upon by scores of devoted undead is precisely Liliana's idea of paradise, but she can't afford to sit idle on Amonkhet. She came to the plane to find—and kill—another of her demon creditors. There was something, Liliana reflected, about shade in the desert. It was always nice, of course, to be in a place where the climate was temperate and the breeze pleasantly cool without intervention. But lounging in a little island of soothing darkness, feeling the searing air all around you, caressed by breezes that never touched the still and sun-baked trees—there was something downright luxurious about that. She chewed a fig thoughtfully. Next to her, a white-wrapped undead servant held the plate of fruit on its head with perfect poise. Behind her, another one of these strange, servile mummies waved a large feathered fan, the source of the pleasant breeze that teased through her hair. She'd told several other mummies to wait in case she needed anything, and they knelt before her, still and sterile. She was accustomed to zombie servants, but these were unusually effective—not just meeting her needs, but anticipating them. She could get used to this place. Except for the omnipresent reminders of Nicol Bolas, who ruled it in absentia as some kind of God-Pharaoh. Except for the way everyone else here was obsessed with gods and trials and some glorious afterlife instead of enjoying the city's evident luxuries. Except for the fact that she wasn't actually using necromancy to command these zombies, so different from the ones she was used to, and didn't know what would happen if she tried. Except, in particular, for Razaketh. Two of the demons who had held the contracts on her soul were dead, killed in surprise attacks by the deadly power of the Chain Veil. Kothophed had sent her after the Veil, an evil relic of tremendous power, and then let her walk right up to him with it—proving that even a demon can be too stupid to live. Griselbrand was far more dangerous, but he'd been bound within a prison of magical silver. Liliana bullied a hapless local into blowing the thing up and shredded the demon while he was still disoriented. Razaketh would make three. But unlike the first two, she had no idea whether she could catch Razaketh by surprise—no idea where on the plane he was or whether he was aware of her presence. 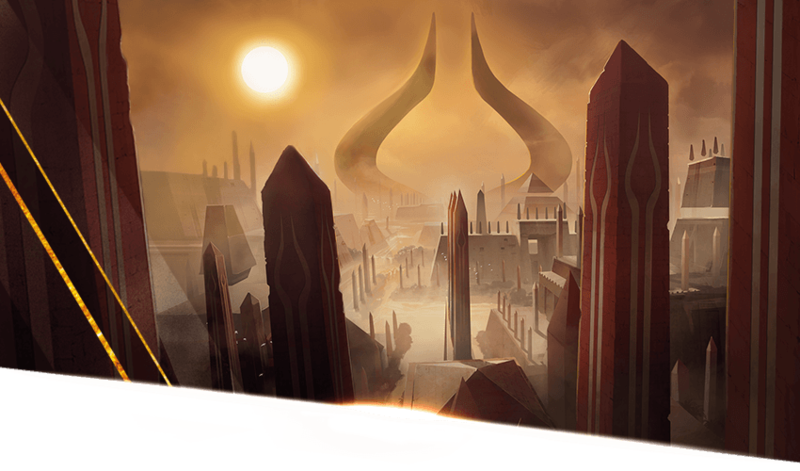 Razaketh was somewhere on this world, a world under the thrall of Nicol Bolas. Bolas was the one who had brokered Liliana's contracts in the first place, and Liliana had no idea how he would view her efforts to break free of them on her own. Regardless of the outcome of the Gatewatch's full-frontal assault on an elder dragon, Liliana was damn well going to make sure they helped her kill Razaketh first. "Shouldn't you be looking for someone?" said a wispy, urbane voice behind her. Just what she needed. The Raven Man. A ghost of the past, figurative or literal, who always knew where she'd been and what she'd been doing. He might not be corporeal. He might even be an affliction of her own mind, a curse or a mental parasite. But he was real, had to be real. She refused to entertain the alternative. Whoever and whatever he was, he had haunted her intermittently since she was young. In the last few years, he'd grown downright chatty. "Don't you have anything better to do?" she asked, not turning around. Liliana's legs were dangling out into the warm sunlight, and she knew the Raven Man preferred to keep to the shadows. So he didn't face her from the front. But he did appear next to her in his archaic black clothing, leaning on one of the poles of her tent and regarding her with his flat golden eyes. "I'm concerned for you, Liliana. One of your demons is in reach, and time is running out." He gestured to the second sun, so close to its final resting place. "Yet here you sit. Eating fruit." "You're well aware that I haven't been idle." She hadn't dared deploy any of her own zombies, not without a deeper understanding of how bootleg necromancy would be greeted in a place where undead servitude was so ubiquitous and well regimented. She'd summoned up a few shades instead, incorporeal undead of darkness and death. She sent them flitting among the shadows between the great monuments, searching for signs of Razaketh. And no matter how long he'd been gone, the Raven Man always seemed to know what she'd been doing. "Ah yes," said the Raven Man. "You sent servants, rather than looking around yourself. No doubt motivated by a desire to remain inconspicuous. Certainly not by fear, I'm sure." "Your scorn is noted," said Liliana. "Now get lost." "I've been very patient. I left you alone during the months you spent on Ravnica, hanging around your clubhouse and do-gooding when it suited you. I stayed quiet during your little excursion to Kaladesh, too, even after it became a dangerous distraction. I trusted that you knew what you were doing. That you were strengthening the bonds of affection that would allow you to manipulate those fools into doing your bidding." "Affection is manipulation," said Liliana. "It worked, didn't it?" "On whom?" said the Raven Man. "You and Jace have split a bottle and reminisced about old times more than once. You're telling me that was just you getting your hooks back into him?" It had happened, a time or three, at her private residence on Ravnica after she joined the Gatewatch. Then Gideon had remarked acidly at some strategy meeting about being unable to find Jace in the early hours of the morning, and that had been the quiet, unremarked-upon end of the thing. "That," said Liliana, "is none of your damned business." "Don't let your affections get the better of you," he said. "Here are your loyal fools, on the very doorstep of your enemies. Yet you do nothing. They're poking around indiscreetly, and you're sitting here risking everything we've worked for. Have you gone soft?" "They've done more for me than you ever have, you worthless phantom." "How hurtful," said the Raven Man, with smirking affront. "Haven't I helped you along your path? Didn't I protect your mind back on Innistrad, when that hooded plaything of yours lost his? Didn't I take command of the Chain Veil to blast you out of that wurm's belly when you arrived here?" Now Liliana did look at him. She'd thought she was dead, sliding down that thing's gullet. She was fuzzy on how she'd gotten out. Taken command . . . Could he actually do that? Had he done it before? "I'm trying to help you," said the Raven Man, smiling. "Razaketh might not know you're here. The sooner you round up your minions and kill him, the better off you'll be. It's time to make use of your useful fools." A flash of blue caught Liliana's eye, moving toward her through the crowd. "Speaking of my minions," she said, smiling, "our favorite telepath is right over there. You might want to make yourself scarce." "Afraid he'll see me?" said the Raven Man. "Afraid of what he could do to you if he did?" said Liliana. The Raven Man's golden eyes narrowed. How gratifying. "Don't forget why you're here," he said, and vanished indignantly. Liliana leaned back, determined to appear relaxed when Jace arrived. She plucked a round, purple grape from the bowl next to her and bit off half of it, curling her bottom lip just so to keep the juice from running down her chin. It was a very fine grape, juicy and sweet. "There you are," said Jace, squinting in the sunlight even under his hood. Liliana had slipped out of her room in their borrowed quarters while Jace was still miserably nursing a mug of thick, bitter beer, eager to see the city on her own. She'd eventually settled in this little tent by the river, sent out her searchers, and ordered some food. She swallowed the grape, seeds and all of course—spitting was so undignified. "Hello, Jace," she said. "Brunch?" "It's past midday," he said. "That's . . . just . . . lunch." "Suit yourself," she said. "More figs for me." Jace shrugged and reached for a fig, but recoiled when he saw what was holding up the plate. "I'd be more comfortable with food that hadn't been handled by corpses." "Jace, I'm surprised at you. I knew the others would be squeamish, but I'd have thought that you'd appreciate the convenience of uncomplaining undead servants. The wrappings are quite sanitary, you know." "Have you ever seen a society like this?" said Jace. "The dead taken away and mummified for servitude, zombies doing all the work?" "No," said Liliana. "Not like this. And the ones in the city are different from the ones outside, if you haven't noticed." "They're certainly tidier," he said. "But yes, I noticed. Out in the sands, one of those wurms rose all by itself. You were . . . down. And I'd have known if there were another necromancer around." Was that concern in his voice? "Those zombies hadn't been under anyone's control in a long time," she said. "If what you're saying about the wurm is true, then it's possible they were raised by some kind of ambient necromancy." "Ambient necromancy? Is there such a thing?" "It might just be what happens here," she said. "It's not a nice place." "What about the ones in here?" "They're . . . strange," she said. The fact was, the serving mummies in the city creeped her out. "Whatever magic raised them, it isn't like mine. And it keeps them under tight control. I've never seen anything like it." "If we knew more about it, we might have a better idea what was happening here." Liliana felt the familiar chill of a shade drawing near, slithering across the shadowy sides of monuments and stretching from one tree's shadow to the next. Jace shivered and scanned the surrounding shadows. Smart boy. "It's mine," she said. He relaxed, but not completely. Smart, paranoid boy. The shade lingered some distance away, unable to comfortably reach Liliana's shelter. Come, it whispered to her. Found. Not exactly sterling conversationalists, shades. "Well," she said aloud. "Looks like I found something." She dismissed the serving mummies with a wave, gathered her skirts, and turned to Jace. "You're planning to follow me," she said. "And if I tell you not to follow me," she said, "you'll turn invisible and follow me anyway." Jace shrugged. "It crossed my mind." "So the only difference is whether I have to look at you along the way?" "Uh . . . I guess?" "Fine," said Liliana. "Come on then." She walked away, following the shade. Jace sighed and followed after her, muttering, "So does that mean you want to look at me, or . . . ?" They strolled along the sunlit thoroughfares, past fit young adults and eerily disciplined children. Shouts of exertion and the scent of clean sweat wafted from training grounds where hundreds of the city's "initiates" practiced combat. Such fine physiques! She couldn't help but imagine them dead and in her service, provided they died cleanly . . .
"Jace . . ." she said. "Have you noticed that all the mummies in the city are maimed?" "Hm?" he said. "I'd noticed that some are. Missing hands, that sort of thing. All of them? Really?" "Even the ones that aren't missing parts have had tendons severed or bones broken. I can tell from how they walk. Does everyone here die a violent death?" "Or," said Jace, "do they do something different with the ones that don't?" "This place is weird," she said. "And it seems like Gideon . . ."
". . . actually likes it here," he finished. "I know." They both made a noise of disgust. "I'm looking for it," said Liliana, smiling. "You're following me. Anyway, it's a secret." "Knowing them, or not knowing them?" "They're trouble either way," he said. "Although not knowing is worse, obviously." Obviously. He was still so innocent in some ways. "Promise you won't be mad?" "Promise you won't tell Gideon?" "Then you figure it out, cloak boy." He walked next to her, thinking. "You're trying to find Nicol Bolas," he said. "I'd just as soon not." "You're going to betray us to Nicol Bolas." "You're . . . looking for something you left behind when you were here before." "Mmm," she said. "Interesting guess. Vague, though." The shade flowed to a stop in the shadows along one wall of a building. The wall was covered in inscriptions. The local script, some symbols she didn't recognize—and some she did. The inscription swam in her vision, and whispers pawed at the edges of her awareness. She swayed, catching herself on the wall of the building. The heat. Must be the heat. Jace didn't reach out to steady her, but he saw her waver. "In the long run," she said. The shade led them around to the entrance. Its substance was starting to unravel, too long exposed to the desert suns. She dismissed it with a wave. The place didn't look open to the public. It didn't have a lock, or even a door, but from what she'd seen that was typical of the city. They walked down a stone ramp, into a long corridor lit by intermittent torches. There were carvings on the walls, depicting initiates battling each other in earnest, some of them lying dead on the ground. There was a shuffling movement behind them, footfalls coming down the ramp. They spun. Nowhere to hide. Hopefully they weren't trespassing. The blank face of a serving mummy came into view, carrying a pile of rags in its arms. Jace and Liliana found an alcove and ducked into it, but the mummy took no notice of them at all. Behind it came another, then another, some dragging their loads, others working in pairs to carry heavier things. The mummies carried the bodies of initiates slain in combat, dripping blood, wrapped in rags. Some were missing pieces. They were freshly dead, going by the smell. An hour or two at most. Next to her, Jace gagged. Once the mummies had passed, she stepped back out into the corridor. "Watch your step," she said. "It's slippery now." "We shouldn't be in here," he said. "Why did we come here? What are you looking for?" "You said yourself that if we understood these mummies, we might learn something about what's going on here." It was all true, as far as that went. But what did any of that have to do with Razaketh? They followed the mummies down the corridor. The carvings around them changed, depicting mummies carrying away dead initiates, then embalming them on slabs, creating more mummies. They entered a large, well-lit central chamber and saw the reality of the carvings. The place was a bustle of activity, the bodies laid out on stone slabs next to tables lined with implements and canopic jars. The smell in here was different, the stench of death mixed with the stale stink of preservatives. The mummies worked in perfect silence, broken only by the shuffle of bandaged feet and the occasional snap, grind, or squelch of the bodies being prepared. So much effort! It was like the mummification she'd read about on other planes, but on an industrial scale. Mummies removed most of the initiates' organs, but here they were placed in large communal jars without decoration. The bodies were mounted on racks for the wrapping process, as efficient as a loom. Not a religious rite. Purely practical. Jace spoke within her mind: This is what they do with all the dead initiates. She didn't appreciate the intrusion, and the mummies, for their part, seemed wholly uninterested in the living, going about their gruesome work with deliberate efficiency. Why would so many die in training? She nudged him and gestured to the far side of the room, where the wall bore some kind of elaborate mural. He nodded, and the two of them crept around the edge of the room. One of the dead bodies began to stir, before it was fully wrapped. It thrashed and shuddered, and the wrapping process clattered to a halt. It was the first thing they'd seen that wasn't efficient and orderly, and they paused to watch. There was no necromancer besides herself, essentially no necromancy—just an upwelling of death magic that seemed to come from everywhere. The mummies overseeing the wrapping process approached the rogue corpse and held it down, while another approached with a large metal plate—a cartouche. They pressed the cartouche into place on the body's chest. The thrashing corpse fell still. Liliana and Jace exchanged a look. They kept moving around the room, as the embalming mummies placed more cartouches on the embalmed bodies. Some began to stir before the cartouches were in place. Others lay still for some time after. 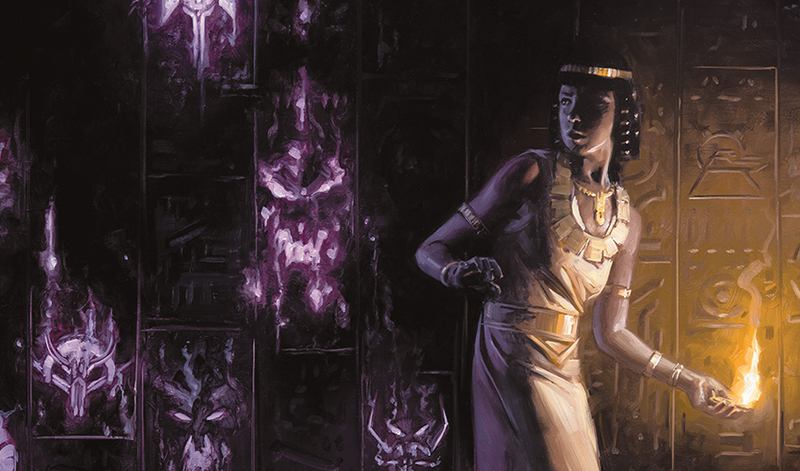 Liliana and Jace stopped in front of a mural carved in dark stone that covered the entire far wall of the chamber. They studied the mural, while the grim work behind them continued. It was a depiction of the afterlife, with iconography that had become familiar from inscriptions around the city. There was the second sun resting between the horns on the horizon, and the enormous gate that (the locals said) barred the way to the afterlife. In this inscription the gate was open, the afterlife beyond it tantalizingly visible—but guarded by a monstrous demon. The final test, read the inscription. The last inglorious death, culling the unworthy who remain. Razaketh's hands were covered in blood, a pile of corpses at his feet. Blood ran into the water of the river. Beyond the gate, Razaketh. Beyond Razaketh, paradise. The carving of Razaketh made Liliana uneasy. Like it was looking back at her. "You're down here looking for one of your damned demons?" hissed Jace. "Two down," said Liliana, a lump in her throat. The carving seemed to loom over her. "He's next." "You should have told us!" said Jace. "We would have helped you!" "You knew about my demons going into this," Liliana shot back. "You're willing to fight them. Do you really think Gideon would have come if I'd told you all? Or Nissa?" "I don't know," snapped Jace. "I would have backed you up. But now, since you lied about it, I don't think—"
"I didn't lie about anything," said Liliana. Her head was pounding. "You didn't tell the truth," said Jace. "You broke our trust." "I never asked you to trust me." Jace said something in reply, something angry, but she couldn't understand it. Her ears were ringing, and her vision swam. The Chain Veil grew warm in her pocket. Protecting her. The carving of Razaketh . . . opened its eyes. They were red, blood red, the only thing she could see. The mummies were staring at her, their work suspended. The products of their efforts stood beside them, a few of them half-unwrapped with cartouches hastily attached. Now she heard her name whispered all around her, from the walls themselves. Are you doing this? Jace's voice spoke inside her head. "Liliana . . ." they whispered. The mummies lunged forward. They were all around, a tangle of bandaged flesh and grasping hands. And still silent, utterly silent—a quiet fight, just the occasional grunt and the whisper of silk wrappings. Jace was casting next to her, pulling the mummies away one at a time with illusory rope. But it was such a small space, and so many bodies. Liliana's head cleared. She reached out, the way she had in the desert, to control them. They were just bodies, no different from any others. Ambient magic. In a flash, she understood it all. There was something on this world—natural or artificial, it hardly mattered—that raised the dead. All the dead, inside the city and out. 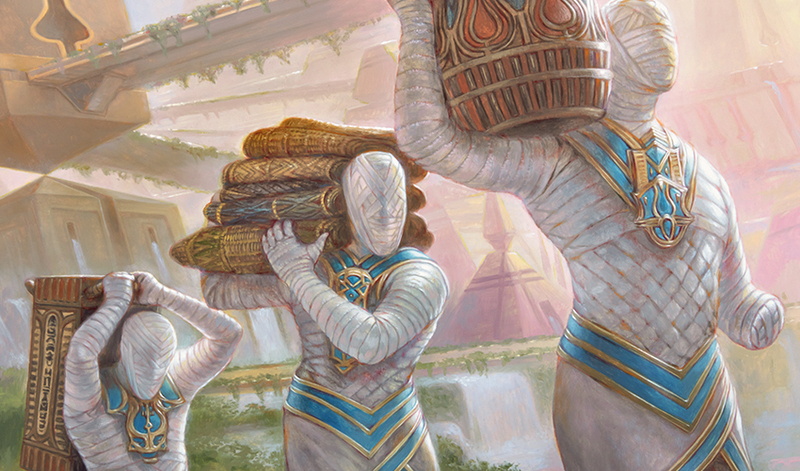 Those who created and commanded the serving mummies didn't need necromancy at all, only a means of control. And that control was direct, physical—far harder to overcome than the whims of a lesser necromancer. "I can't control them," she said. "The cartouches—"
She grabbed the nearest mummy, dug her fingers around the edges of the cartouche, and wrenched it as hard as she could. Jace saw what she was doing and gave her the assist, grabbing the mummy around the neck and pulling it away from her. With a fleshy snap, the cartouche came loose. Then there was a pop, and a sizzle. The hole left by the cartouche burned with blinding white light, and the mummy fell apart. Then the mummies were all around them, too many, grasping them by limbs and throats. She reached for the Chain Veil. She'd been desperately avoiding it, but if that was what it took to survive . . . The mummies froze, holding them in place. Then some of them shuffled aside, parting to let someone through. "You really are outsiders," he said. 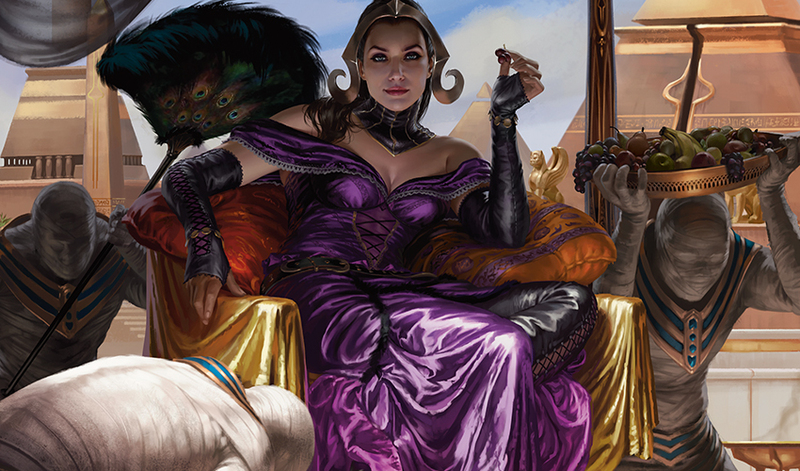 Liliana had taken an immediate disliking to the arrogant young vizier who'd graciously granted them housing in the city. Too poised, too self-assured. She'd even wondered, initially, if he might be older than he looked—much older, like she was. But no. He was a teenager. Like everyone else here, he'd been honed to a sharp edge at a very young age. Now that edge was turned on them, with enough force that Liliana couldn't quite dismiss him as a child playing at authority. "I didn't believe it at first. Whoever heard of such a thing?" He came closer, examining them. Keep him talking, said Jace in her mind. He's got some kind of protection. I need a minute. 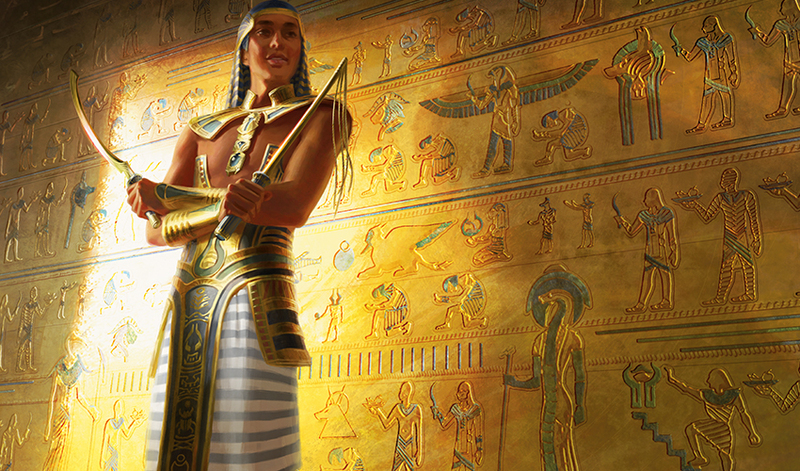 "But I checked the birth records at the Monument of Knowledge," Temmet went on. "Kefnet knows all, but his viziers do not know you. And now you're down here, snooping around the sacred embalming chambers. You're truly ignorant of our ways. You know nothing of the Horned One—may his return come quickly, and may we be found—"
"We've met him, actually," said Liliana. Jace and Temmet looked equally shocked. "And just so you know, he's a complete a—"
Mummified hands tightened around her throat, cutting her off. Then Temmet's eyes glowed blue and his face went slack. A moment later, the mummies' hands released their grip. Jace grabbed her arm. His eyes were glowing too, blue light leaking out around the edges, and his face was contorted. "Can't . . ." said Jace. ". . . much . . . longer . . ."
Oh. Jace was controlling Temmet, and Temmet was controlling the mummies, and that had to be taking a toll on the dear boy's mind. Not all of the mummies were still. There were too many, probably. Jace barely had control. 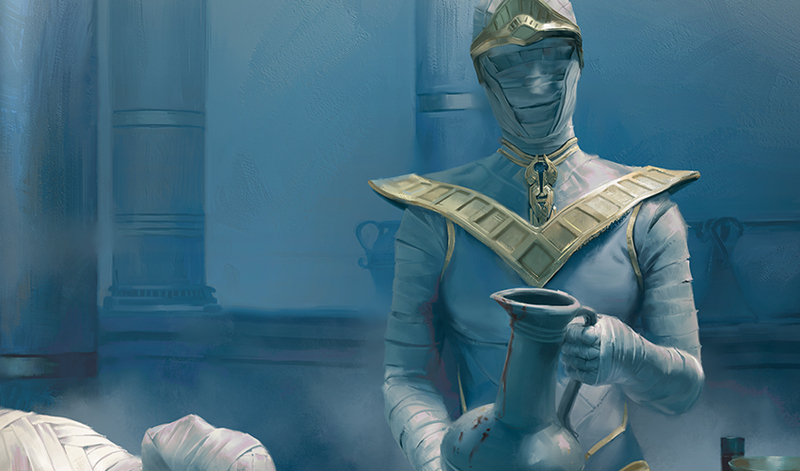 Liliana shouldered the nearest mummy aside and ran, away from the carving's red eyes and the embalming chamber and the stink of death and stillness. She ran. Outside. Blinding suns. Her heart was pounding. Jace's eyes cleared. Liliana glanced backward, but didn't see any pursuit. Not yet. "That . . ." wheezed Jace, ". . . was your idea to keep him talking? Blasphemy?" For a moment, they just breathed and ran. "What . . . happened back there?" he asked. "Razaketh," she replied. "The demon. I think . . . he's involved with this afterlife. And he knows . . . I'm here. Chain Veil's the only reason he can't . . . activate my contract." "You wiped Temmet's mind, at least?" "No," he said. "It was all I could do . . . to keep the mummies off us. He'll be out for a while, and he'll wake up with a hell . . . of a headache. But he'll remember." "Then we have to find the others," said Liliana. It's time to make use of your useful fools, the Raven Man had said. Whether they were friends or fools, Liliana needed them. She ran, away from her demon, toward help.